A few weeks back a Singapore based firm that sells the EMOLUX series of filters, conversion lenses and accessories, contacted me and asked if I was interested in doing a review of a wide-angle add-on! I naturally said YES! 🙂 It has sort of become an interest of mine and a lot of my blog readers! I was allowed to pick from their quite extensive selection of lens add-ons. Being a Canon photographer myself and also being a blogger I naturally picked an add-on for the most common Canon lens, the Canon EF-S 18-55mm f/3.5-5.6 IS II kit lens with 58mm filter thread! 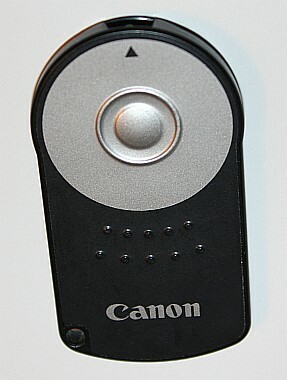 For those of you that are not so familiar with Canon products this is a lens for a APS-C size sensor Canon camera. The company has NOT interfered with my review in any way and has let me write this review in my usual style and all the results and opinions are my own! I picked the EMOLUX 0.45x PRO HD 58mm as I thought that was the one most people (well at least many Canon photographers 😉 ) would be interested in. I would hope, though, that this review also would interest photographers with other camera brands as well as this wide angle add-on or conversion lens comes in many other sizes for other cameras as well! I have seen prices on the web of around €80/£71/$95 for this (November 2017). As with my previous tests I wanted to compare the add-on and kit lens combo with my $480 Sigma 10-20mm f/4-5.6 EX DC HSM. Well, let’s start from the beginning! The EMOLUX 0.45x PRO HD comes in a rather stylish black, green and silver box with the usual writings on the mostly black box. I will just mention a few: 0.45x magnification, Broadband Multi Layer Anti-reflection coating and it also states that Lens Compatibility is f=28mm. I will comment on these claims in the following text. You get the add-on packed in one of those double boxed solutions. With a nice looking outer box and a sturdy brown carton inner box. The lens add-on is packed in a proper faux leather, slightly padded, lens pouch with a 86mm lens cap and a 58mm rear lens cover. As can be seen from the picture the wide angle lens add-on is much wider then the Zeikos ZE-WA58B that I tested previously. The Emolux looks as if it could actually do the job – properly! It is weighing 312 gr on my scale – bare! And 375 gr with covers and lens pouch. Together with the kit lens the combo weighs 512 gr. 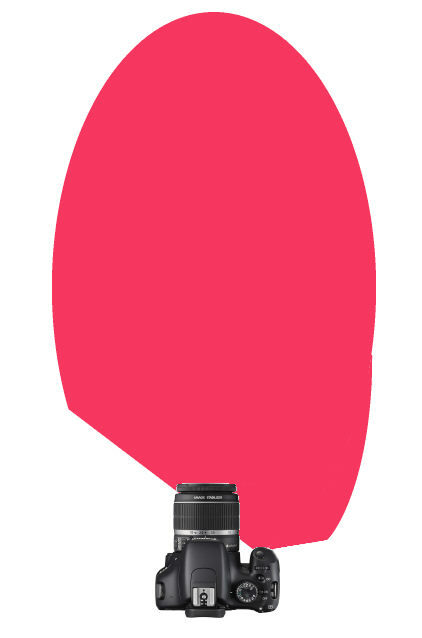 That is very close to the same weight as that of the Sigma (508 gr) – albeit the Sigma is then including a lens hood! Removing the large spring loaded plastic lens cap reveals the almost(?) flat front lens. It is obviously anti-reflex coated as one can see green, blue and purple slight reflections from the lenses inside the add-on. They call it “Broadband Multi Layer Anti-reflection” coating and I can not dispute that. What puzzles me a little is that it states that Lens Compatability is f=28mm. It is very natural to assume that is means that it works well with a wide angle lens with equivalent focal length of 28mm! In my case it would have to mean f=18mm as that is the equivalent of f=28.8 – using the Canon crop factor of 1.6 – maybe even with 0.8 mm to spare! It does NOT say anything like that on the box so these (in my opinion very reasonable) assumptions are my own! As you will see from my following testing this seems to be correct! The EMOLUX 0.45x PRO HD is a rather impressive looking add-on. It widens in two separate steps from the 58 mm filter thread at the back. First it widens onto a rubber coated grip-friendly ring and then the second widening is to the full 88 mm outer brim – filter thread is slightly less at 86 mm. It is quite easy to hold it both on the rim and especially well on rubberized inner ring. It looks quite impressive screwed onto the rather anonymous 18-55mm lens. Want to impress someone? This add-on is the thing to get! 😉 All the lens surfaces are clean looking and looking through the lens is like looking trough crystal clear water! It is built as one single unit. Nothing that can be screwed apart – as with the other add-ons. The rear lens is opening a full 52.5 mm towards the original lens – boding good for the light transfer! We will soon see if this bears out in the testing! These types of add-on lenses you screw onto the front of an ordinary lens using its filter thread. That said the add-on must naturally have the proper size to fit in your lens filter thread. In my case 58 mm. It will fit on all (most?) lenses with 58 mm filter thread. 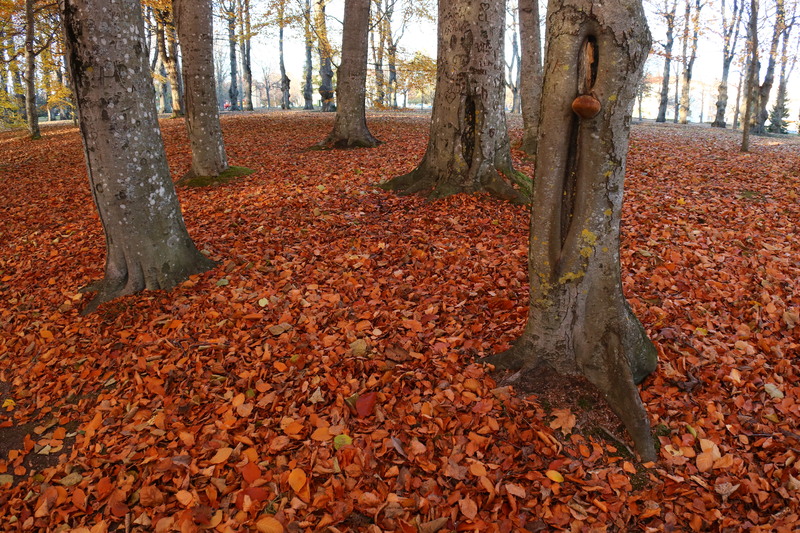 These types of wide angle add-ons makes most sense to use either on a fixed prime lens or on a zoom lens. It is also worth noting that as the reason for having a wide angle add-on is (naturally) to get a wider angle of view so the zoom lens should (naturally) be used in the wide angle end! There is no idea using the tele side of the zoom lens with this type of add-on! There exists instead teletype of add-ons for that particular purpose! Screwing the EMOLUX 0.45x PRO HD onto my Canon EF-S 18-55 mm was quite easy. You want to be a litle careful as the Canon lens is made of plastic and the Emolux is made from metal! A trick is to place it against the thread and turn it slightly backwards till you feel a little “bump” – then carefully try to feel if it will catch the proper thread. Repeat until successful! Works best – I think – with the camera on the back with the lens pointing upwards! This review would not be complete if I did not mention that this is a substantial piece of lens to put onto your original lens. It is quite an impressive chunk – it booth looks impressive and feels it too! (See the picture to the left!) It works surprisingly well with automatic focusing – you feel the focusing move a little clearer but it focuses almost as quickly as normal. The contrast focusing in live view seems to need just a little bit extra time. Manual focusing I think feels actually a little better than normal, because of the bigger diameter – especially the rubberized ring! As you can see i the picture it is much bigger than the original focus ring! 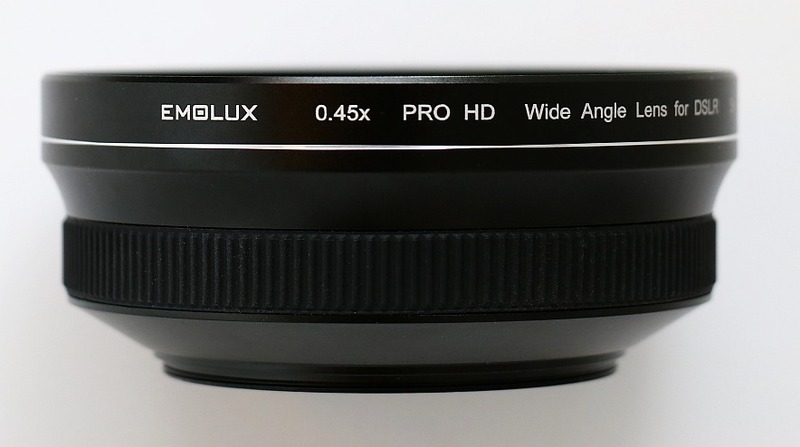 Is the EMOLUX 0.45x PRO HD converting the 18mm of the kit lens to 0.45 x 18mm = 8.1 mm? Well, I have to say no! 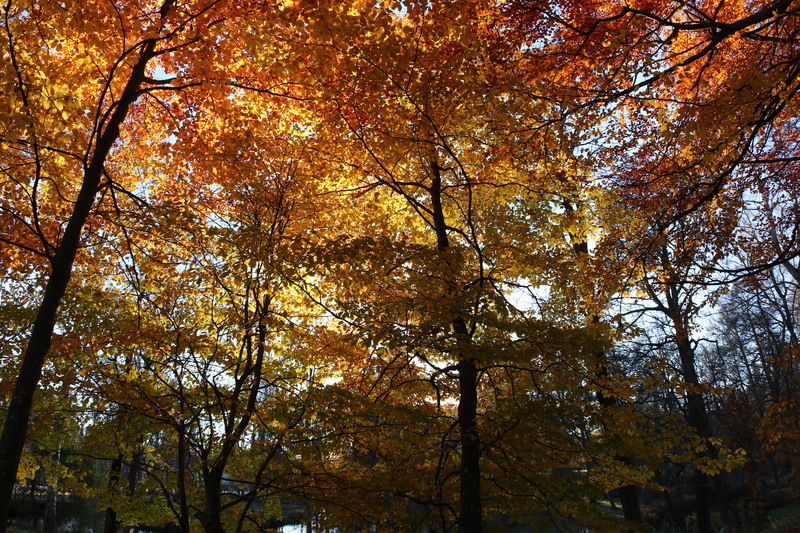 It is the same as other wide angle add-ons with the same statement. They are not stating that it is actually converting the focal length that much – but it is sooo easy for us consumers to jump to that conclusion! As I have calculated earlier the focal length you get is around 11.8mm which gives you an additional 0.45x the area or 45% more area coverage. 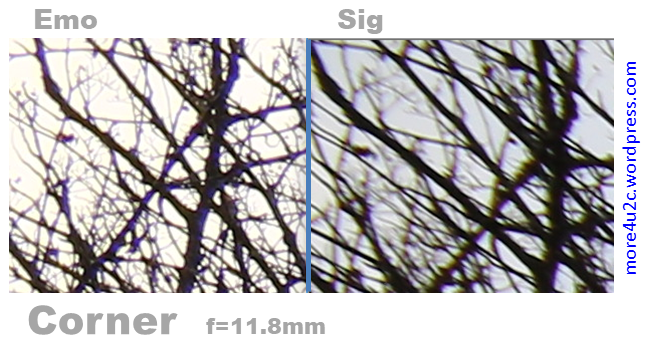 If you are interested the resulting focal length factor is around 0.65x. 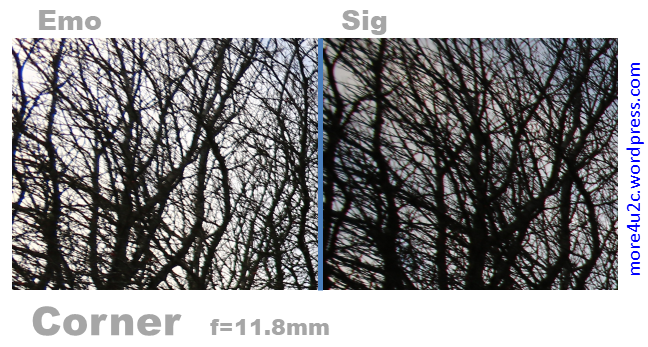 At the wide angle end of a zoom lens every mm matters a lot – even just 1.8mm difference to Sigmas 10mm! You can easily see in the comparison pictures that the Sigma has a wider angle at its 10 mm setting – which I think has proved this point! First of all: How should you test two “lenses” like this? What is a fair comparison? How would you use a wide angle lens combo like this? Well, I would use it at its widest angle – naturally depending on the motif! 😉 What I mean is that I would not want to keep off using the widest angle – so it would have to be good enough! I have refrained from any detailed comparison of the Emolux and other add-ons I have tested because this is a real add-on conversion lens! 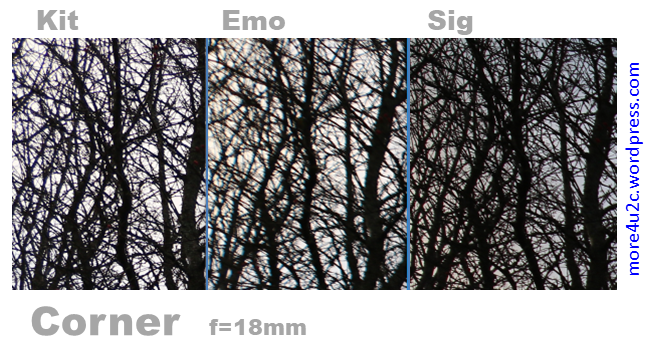 It is much more relevant to compare the Emolux add-on to a proper wide angle lens like the Sigma! Also to consider is how you intend to use the pictures! Is it smaller pictures shown on the web? Then you are lucky as you can pick as you please – because it will matter very little – sharpness wise. No one will see any direct fault with your pictures whichever alternative you pick! Do you intend to make large meter size prints? Well then only the best lens and the best aperture for that lens will do! The first test spin I took the EMOLUX 0.45x PRO HD was on a lovely, sunny, but a little cold autumn day shortly after lunch. 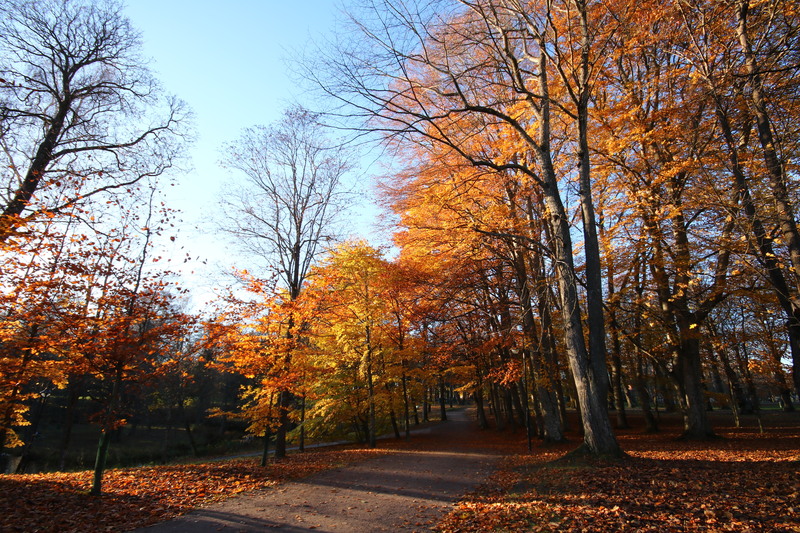 Here in Sweden we are just finishing autumn and will move into winter any day now! I naturally brought along my Sigma 10-20mm f/4-5.6 EX DC HSM for comparison. 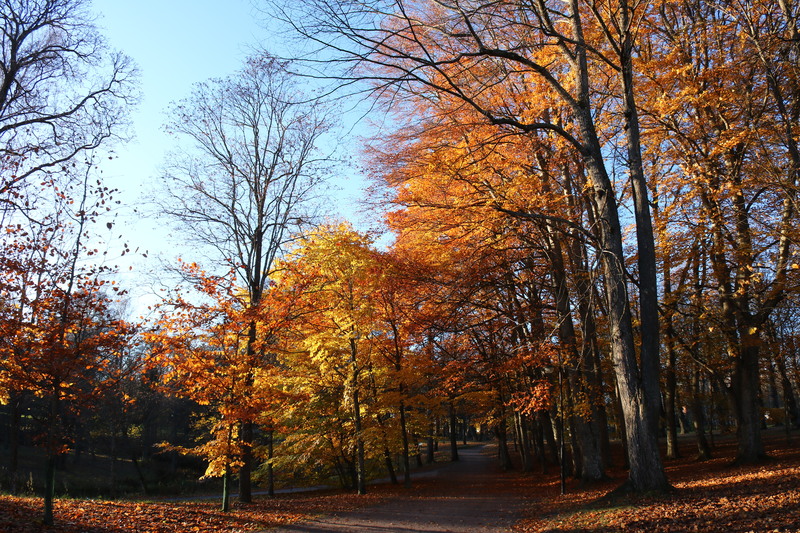 The local park with its colourful autumn leaves I thought would be a great place to try it out. I screwed the EMOLUX onto my Canon EF-S 18-55mm f/3.5-5.6 IS II kit lens and, with the camera on a tripod, I took a number of comparison pictures with the help of a infrared remote control and I also took a number of free hand sample pictures. My main camera nowadays is Canon EOS 760D, an APS-C cropped sensor camera, and I naturally used that for this test. I got a number of pictures done! The second test spin was a few days later and I thought that winter slowly had begun because of a thin layer of snow and a few degrees below frezzing. I was waiting for the light to improve and it was a little late in the afternoon before I could go out for the test. The light was fading so quickly that I decided to go out a third time. I really had to wait for the third test spin to get a day with decent light! Finally it arrived and I brought along all my stuff outside once more. The list of all the settings and different combinations that I wanted to do, the tripod, all the lenses, camera, warm gloves and a nice knitted cap! Now all the previous (little) snow had disappeared and turned into water and mostly been sucked up by the grass and soil. The temperature a few degrees above freezing. A pale sun barely crept over the horizon. At last I had all the comparison pictures of all the settings and with all the lenses in reasonable similar lighting conditions, that I wanted! I have compared the EMOLUX 0.45x PRO HD + Canon EF-S 18-55 mm (“the Combo”) with both the Canon EF-S 18-55 mm (“the Kit Lens”) and the Sigma 10-20mm f/4-5.6 EX DC HSM. According to my calculations with the “Combo” you will get a new wide angle zoom with the range 11.8-36.1 mm. Full screen viewing is when the picture is shown on the display screen so that you can see the whole picture at the same time on the display! That also means that it is scaled down to the resolution of the display screen. All viewing was done on a 24″, 1920×1200 pixel, factory colour calibrated, DELL U2410 computer display. All comparison pictures are taken with “Av” mode (aperture value selection) and fully automatic exposure. As we stop down the lenses the difference gets so small that I would call them both as sharp or at least extremely difficult to differentiate from each other. The optimal aperture for all lenses is around f11.0 give or take 1 f-stop. Continuing with widest angle that all three lenses have in common – the resulting focal length of 18 mm with full aperture. I have included that focal length here for completeness sake as you would probably not want to unscrew the Emolux every time you need something else than the widest angle! So it is interesting to see how it performs also at this focal length! For the resulting focal length of 18 mm: ALL the pictures from ALL the lenses look perfect in the major centre part of the pictures when viewed full screen on a 24″, 1920×1200 pixel, factory calibrated, DELL U2410 screen. I will not bother to show cut outs for this as they all look very similar! Less blurring is visible at the top and bottom sides. For 18 mm corner softness improves a lot by stopping down the lenses. At each lens’s optimal aperture there is practically no difference at all in full screen viewing for any part of the picture! That goes for all other focal lengths as well. 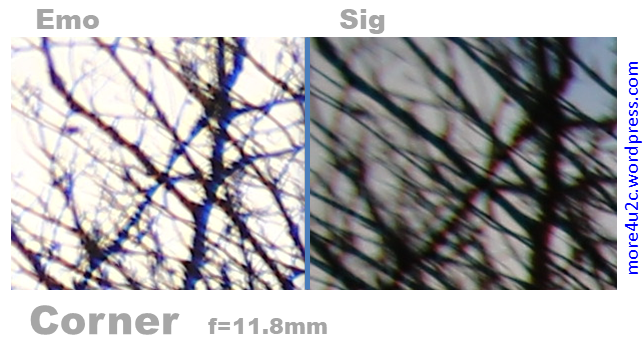 There is slightly more corner blurring at the widest angles 11.8 mm and 10 mm – both for Emolux and Sigma. Nothing to get worked up about and at lesser picture sizes not noticeable! And this is also probably the way that most people will use the pictures! BUT if you need pin sharpness then stopping down might be good enough for you or else you will have to shift lenses! At the maximum tele setting for the Combo 36.1 mm the sharpness at full aperture is respectable with the Emolux but it is better with the kit lens. Even if sharpness gets better for both lenses as you stop down the kit lens is slightly sharper. The TrippleCrop illustrates this well – a difference but not that big. Very similar sharpness for all three lenses for the major centre part for all apertures and all focal lengths! 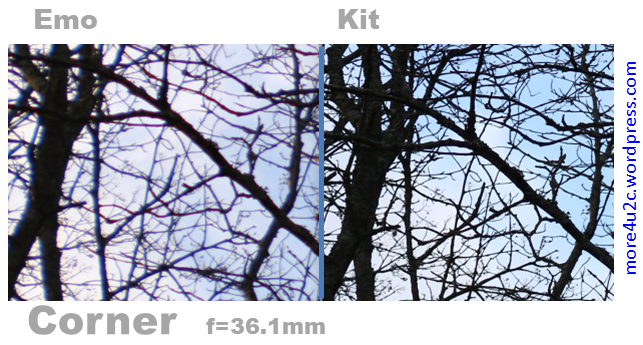 Slight blurring of corners for the wider angles for kit and slightly more for Emolux at larger apertures – but diminishing at smaller apertures. All in all very similar sharpness. If you intend to do large scale prints – maybe meter (several feet) size – then you should chose your photo equipment accordingly! You should probably go for a full size sensor and very expensive lenses. You would also need to use the best aperture for your lens and naturally also a sturdy tripod – this is not for everybody! “Pixel Peeping” is when the picture is shown on the display screen so that you can see each pixel of the picture on the display! That also means that you can only see part of the picture and will have to scroll around the display screen. All viewing was done on a 24″, 1920×1200 pixel, factory colour calibrated, DELL U2410 computer display. 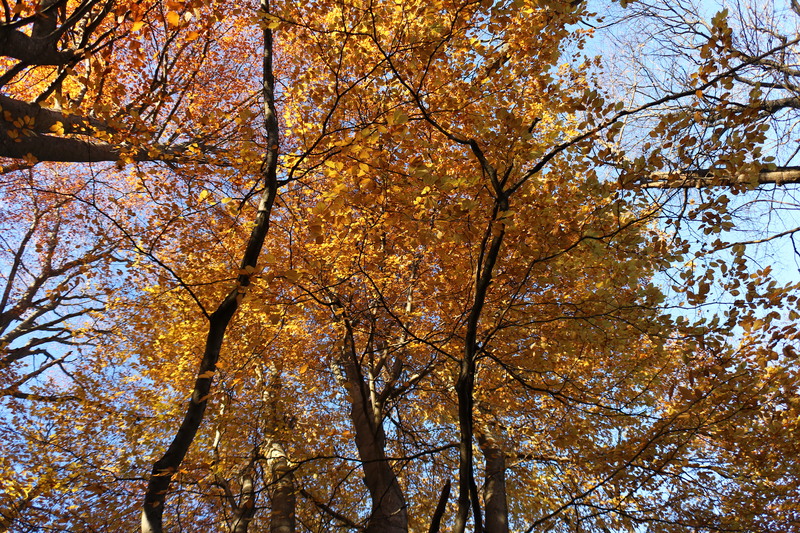 All comparison pictures are taken with “Av” mode (aperture value selection) and fully automatic exposure. A typical 24″ full HD screen is 20.5″ wide with a horisontal resolution of 1920 pixels. The pictures from my Canon EOS 760D has a resolution of 6000×4000 pixels. 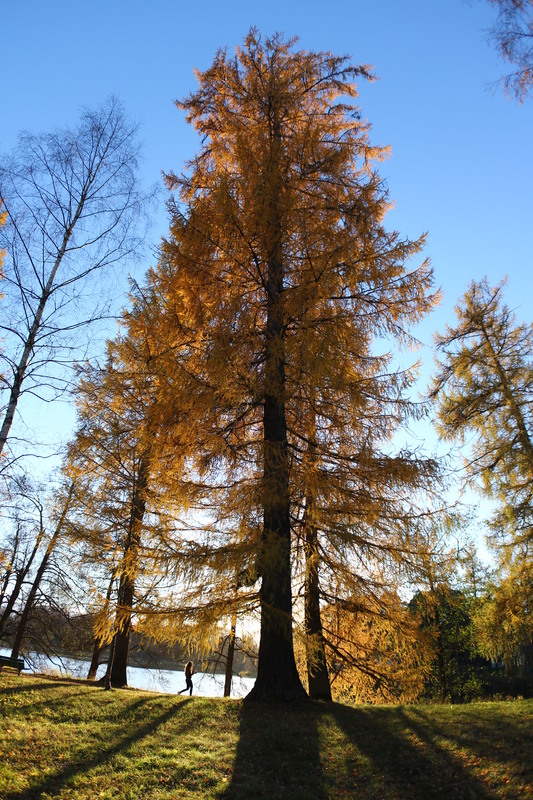 Looking at such a picture on a pixel for pixel basis would result in looking at a picture with a total size of over 3 times the width of my screen. It would actually be over 64″ /5 feet/162 cm wide! We should always keep that in mind when we now look at the following TrippleCrops and comparison pictures on the pixel level! Here any difference will be seen! Looking att the pixel level the corners of these pictures does not look very sharp at fully open aperture. The shock is that “the Combo” is actually better than the expensive Sigma – the aperture for the Emolux is f4.0 and for the Sigma at this focal length it is f4.5. Here you can also see that there is some chromatic aberration – cyan (bluish) for the Emolux and magenta (reddish) for the Sigma. Also the difference in exposure is quite big! Stopping down aperture to f11.0 improves the sharpness quite a bit! Also the chomatic aberration is less and now both are in the purple range. But still I think that the Emolux is sharper than the Sigma – and that goes for the entire f-stop range! The centre sharpness is very good through the whole f-stop range! Fantastic that the low price Combo is actually as good as the Sigma all over the f-stop range! Here the exposure difference is small. Click them to see the full size pictures! 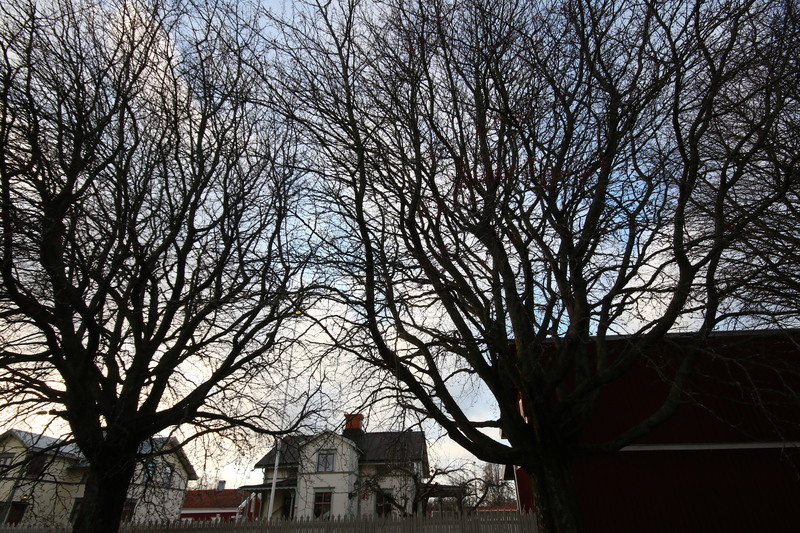 Above: Sample pictures with the Emolux and the Sigma lens at their widest 11.8 mm and 10 mm at f11.0. Not directly comparable but you can easily see the difference in wide angles! The Sigma is slightly wider. 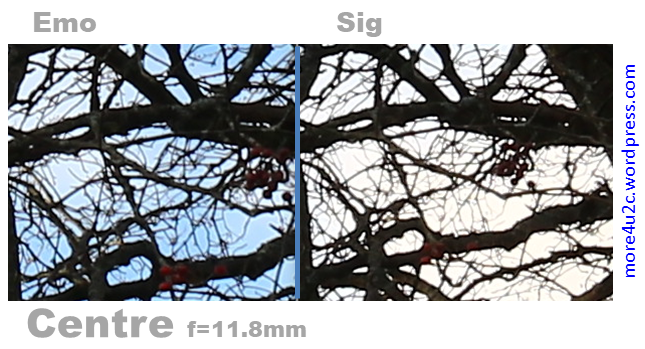 Above: Full size comparison picture from Emolux and Sigma at optimum f-stop. Here the Emolux is tested on the popular Canon EF-S 18-55mm f/3.5-5.6 IS II kit lens. 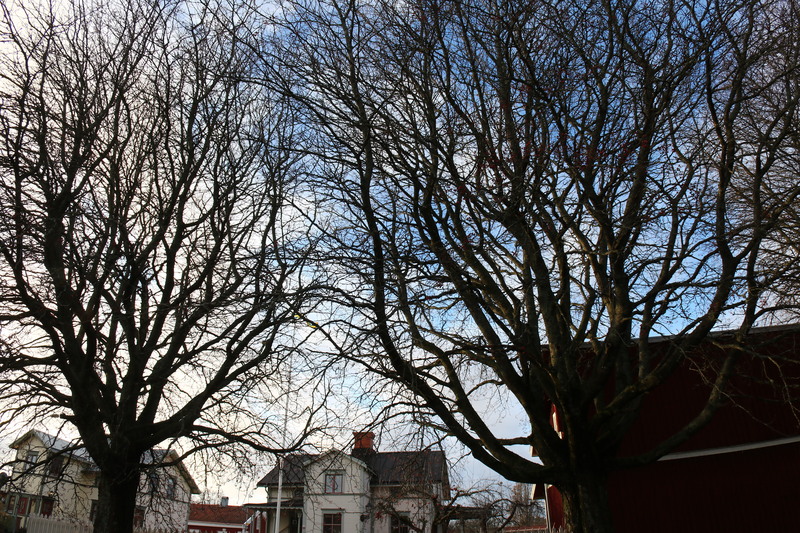 First of all, I can see NO vignetting – this really works as a wide angle add-on should work! 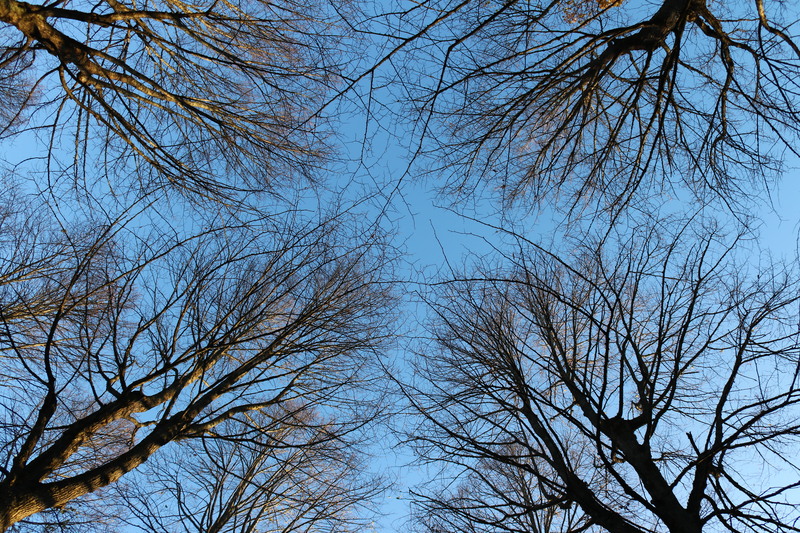 I could use it at my widest angle of the 18-55 mm lens and – and no noticeable vignetting! This is clearly where the Emolux has its greatest advantage! Or, as I already have said, rather it works as one would expect a wide angel add-on to work! It would also be really super on a video camera or any camera with a fixed lens – when this is the only way to get the wider angle! With the huge front lens gathering a lot of light I saw no change of exposure times compared to using only the kit lens – even if that was not in my testing scope. That is always good! As I took natural pictures in a naturally varying environment this could also be due to natural variations between lens swaps. It could go either way! The centre sharpness is very good through the whole f-stop range! Practically as good as the Sigma and almost as good as the kit lens. Talking about corner and edge sharpness gives a more mixed result. I can not say that the corner sharpness is good! But this has to be considered in comparison of what to expect! The sharpness can naturally not be any better than the lens on which it is attached! The corner sharpness is naturally the toughest to master as this is the widest of angle of the picture. The EMOLUX 0.45x PRO HD is definitely a quite usable alternative to a wide angle lens with quite good quality. For this low price though you have to accept some compromises concerning corner sharpness. So is the EMOLUX 0.45x PRO HD worth having? I would say yes – if you want a wider angle of decent to good quality at a reasonable price! Most especially if your camera can not swap lenses – then this is a very good solution! For this price though you have to accept some compromises concerning corner sharpness.! Also remember that this combo is bulkier, but need not be heavier, than a single lens solution.